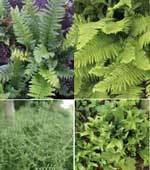 These are a mixed collection of 12 x native fern cultivars suitable for dry shade. This will usually consist of three 9cm pots each of four different fern varieties. They will include Asplenium, Polypodium, Dryopteris and Polystichum in 9cm pots ready for planting out. Please note - the exact make up may change depending upon stock levels but will include ferns of different eventual height and widths. A great collection and fantastic value for money!